So basically this is Platinum status from a few years ago, before all the double elite qualifying miles promotions and all that other good stuff. The idea as such of a fourth tier is a good one, in my opinion, given the huge combined elite ranks of Delta/Northwest. I would expect that Platinum members will have close to a 100% success rate with domestic upgrades. Other than that, the benefits are by no means fantastic, although they’re not bad either. The one thing I was desperately hoping for were some “real” systemwide upgrades which wouldn’t require a ridiculously expensive coach fare, but they quite purposefully left that out. I would argue that despite requiring 25,000 more flown miles, Diamond isn’t as good as Executive Platinum at American or 1K at United, thanks largely to the international systemwide upgrades. Diamond is probably better than US Airways Chairman, although that has more to do with the product as such instead of the actual benefits. As of now they have a slight edge to Continental, although I bet we’ll see some adjustments in Continental’s program soon. I see a lot of people speculating about how the other airlines will react to this. I’m betting they won’t. This is a non-event. American and United know their elite programs are better, so there really isn’t much of a need to throw in a free lounge membership or more redeemable miles. Continental is the only airline where we might see a reaction, but that has a lot more to do with their transition to the Star Alliance than anything else. Wow. At 4 PM, I had decided to dump AA and stay with DL. Now that the full details are out, GOODBYE DELTA!! Oh, and now I really CAN’T WAIT TO HEAR WHAT HUNTER HAS TO SAY!!!!!!!!! As a current Diamond (at around 150K MQM’s) I think I can speak for the majority of FlyerTalk members (at least based on conversations last night) and say I’m underwhelmed. The only new benefits were ones that were removed from DL or NW Platinum members over the past 3 years or so. – Free SkyClub access used to be a DL Plat benefit until (I believe) 3 years ago. The ONLY real change is the removal of ticketing fees for Gold/Plat/Diamond and, IMHO, doesn’t distinguish Diamond very much. Additionally, the systemwide certs only change is day of departure upgrades. No use on less expensive fare classes so, on average, the difference between an M fare (lowest to use PMU) is ~$1,000-1,500 more than a K fare. I can’t see any reason to fly 66% more on DL to achieve Diamond over Platinum and will likely consider status matching over to UA/AA at some point this year to build up mid-tier or top tier status since I see no incentive to achieve Diamond. Instead of going ahead and adding a tangible benefit (maybe redeem 2 awards at “low” regardless of “cost”) that meant something to travelers, they’ve just put lipstick on the pig. Actually as a NW Platinum for 10 years and a Milion-Miler, I haven’t paid ticketing fees ever. The only fees I’ve incurred on paid tickets are changes to non-refundable tickets. Never paid for calling an Elite agent, never paid for booking an award ticket 3 hours before departure. Clearly the biggest disappointment here are the crummy System Wide Upgrades. They stink. In fact Jeff Robertson, who runs the program for DL, admits only 20% of Platinums use the certificates. If so, what’s the point? And being able to use them now on the day of departure doesn’t really do anything because, again, the SWU’s are only good on the highest three international fare classes. I remind former NW Platinums that the last 2 years of the program’s independence, we received (2) SWU’s from ANY FARE CLASS DOMESTICALLY & INTERNATIONALLY if we reched 125k and 160k annual flight miles. Now those were some really useful SWU’s. Aren’t you overlooking some items that exceed the “old” Platinum, such as award ticket upgrades, the ability to gift Gold or Silver, and the fact that a DM will get to choose a total of three of the Choice items, which amounts to a lot? Also, fee waivers in place now weren’t present under the old PM structure. This is really better described as a way to screw Platinum members that are over 75K, but will not get to 150K. What a joke. The new rollover benefit is rather interesting. If you fly 124,500 miles, you get a whopping 49,500 miles as a Platinum Member to use toward qualifying status the following year. However, if you fly 125,500 you can carry a Diamond Card and get the benefit of 500 rollover miles for the following year. So, yes, I will have flown 50K more miles to qualify for the next level and will have lost 49K miles for the rollover option. What genius thought that one up? One solution would be to credit diamond members with 50K miles towards Pt status and 500 miles towards renewing the Diamond Level. Finally, ditto with respect to the SWUs they would have some value if they could be used on less expensive fare classes. The new Delta has basically blocked any intercontinental upgrades under $2,000. The cheapest I recently found was $2100 to Heathrow (they should actually pay us to go to that miserable airport). Yikes you guys are a bunch of whiners. Gee, I could fly 75,000 miles on Delta and be Platinum, and 50,000 miles on American and be Gold. Or, I could fly 125,000 miles on Delta and be Diamond- which is about the same as being Platinum! I might as well have high status on 2 airlines! My thought as i reach the new diamond level on my next flight is that I’m giving up 50,000 “roll over miles” for little or no gain. I reached 2m miles a month a go with out even a thank you note or email. If I wasn’t from Detroit I would consider another airline. If Delta won’t adopt Vince’s absolutely sensible proposal (see above), will it at least allow us to decline diamond status and elect to rollover instead? I’d be perfectly happy (and would certainly decline diamond) even if they capped the amount I can roll over at “only” 49,999 miles. 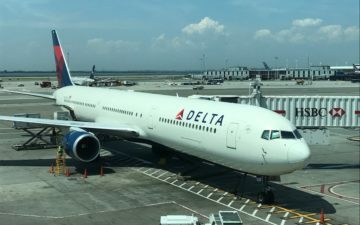 Just an FYI, but Delta is doing away with upgrades on flights with “Business Elite”. For me this all of South America and over 50% of my other destinations even some US flights. Diamond members beware of what Delta has gift wrapped here, it’s their bottom line they were thinking of, not us Diamond members. What’s your source on this info? I haven’t heard that yet. The other point worth making is that the SW upgrades are not necessarily available simply by purchasing a Y,B, M fare. I did however finally manage to use one last week on a TPE-NRT but was sitting in coach from NRT-ATL on an M fare. I’ve been 100% on non-international. So far, I’ve successfully used only 1 SWU in the past 3 years. I would gladly give up multiple coupons for a single guaranteed upgrade on a K fare.